potentially nervous: yard sale, bunny not included. yard sale, bunny not included. I'll trade one carrot for one nose bonk! 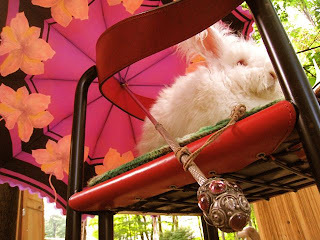 Nuage will perform bunny divination (the reading of the poops) and bless you with that odd scepter hanging form the chair for just 10 bucks. Such a deal! Ok so I was going to say something until I read d.moll's note and now I'm hardly able to type!! Toooo frick'in funny!!! The bunny doesn't come with the chair? Forget it, then. D.moll is just too funny. That made my day! Just foun' you buns -- your buns -- ok, dat's weird, too. Anyway, mom sez u takes terrific pix! Nuage is the king of the yard! Haha, d.mol that made made my day. Of course, Nuage is gorgeous too. Maybe if I had an umbrella like that one I wouldn't forget where I left it. Can Nuage divine the location of my Winnie the Pooh umbrella?